If you haven't filed taxes for several years, or if you've never filed taxes, there's still hope for you. However, you may not receive any tax refunds since they expire after three years. It will be beneficial to focus instead on filing your late tax returns as soon as possible and protecting your refunds in the future. Filing a late return can be stressful, and the stress can be worse if you have several years of tax returns to prepare instead of just one. But if you can spare a couple of weekends, you can catch up with the IRS. The key to successfully filing a late tax return is finding all of your tax documents. If you have your original W-2 forms, you're in great shape. But if you are missing any tax documents, the Internal Revenue Service can help you out. The IRS has copies of all tax documents filed under your Social Security Number. The agency usually keeps four years worth of tax documents in its digital archive. You can call the IRS and ask for a transcript of your documents to be mailed to you. The printouts will not show any information related to state income tax withholding. 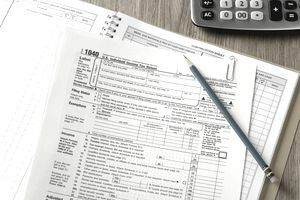 If the state you live in has an income tax, you should try to find your original W-2 forms or contact the state's revenue or taxation division to see if it has any information about your state withholding. If you have a refund, there's no penalty for filing the return late. That's right, no late filing penalty and no interest. Penalties kick in only if you owe the IRS. And if you owe, the IRS will assess not just one, but three different penalties. There's a failure to file penalty (a stiff 5 percent per month that you are late, up to a maximum of 25 percent). Then there's the failure to pay penalty (a much milder half-a-percent per month). And then there's interest on the taxes you didn't pay. The IRS sets the interest rate every quarter. Now, here are some tricks I have learned over the years of helping many people get caught up on their taxes. If you don't have your W-2 forms and you are using the file from the IRS instead, you will need to transfer all the same information on the printout to IRS Form 4852 (PDF). If you are using tax preparation software, you should add that form to your tax return and type in the relevant information. You also need to sign Form 4852, and you should attach a copy of the IRS file. That way, the IRS will know that you have a reliable source for the numbers on your tax return. A second trick I learned is that you can usually find tax preparation software for older years through products such as H&R Block's TaxCut, TaxACT, and Intuit's TurboTax. Each software program has its pros and cons, but all three will suit you well for preparing your tax returns. You can also find prior-year federal tax forms at the IRS website. If you're going to prepare the returns yourself, you'll want to use the same product for all the years you need to file. This way you can easily import your tax information from one year to another, saving you time from repetitive data entry. You might also want to talk to a tax professional. Be sure to protect yourself first by asking some questions before hiring a tax accountant. Back Taxes (six steps for filing a late return). Missing Tax Documents (how to get a printout from the IRS). Time Limits for Refunds, Audits, and Collections (including the three-year period for claiming a refund). IRS Penalties and Interest (in case you owe additional taxes). How to Get out of Tax Debt (covers all sorts of payment arrangements).